LEED should reward urban projects for vegetation and green infrastructure, but it seems to have lost sight of this goal. 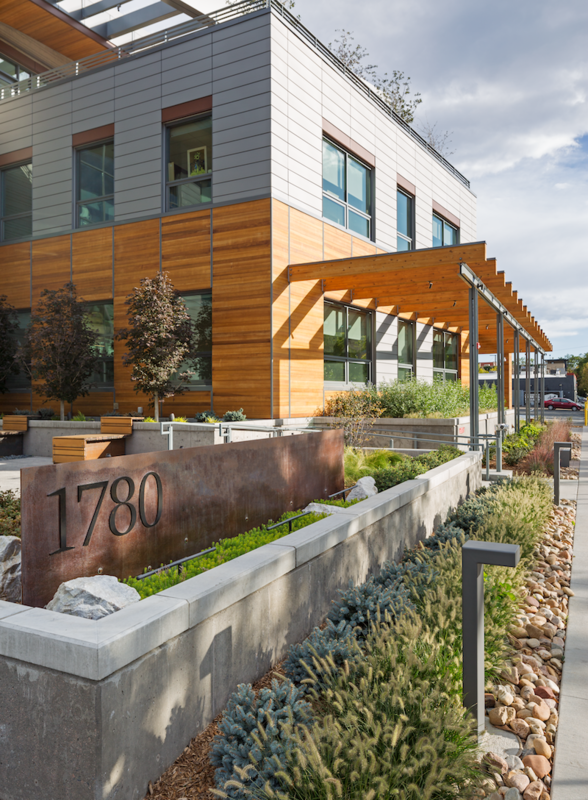 Despite extensive LID strategies, this Colorado project did not achieve the rainwater management credit under LEED v4. When LEED v4 BD+C was released, there were a handful of improvements that I was really excited about: the new interior lighting credit, better daylight metrics, transit points based on number of trips, and envelope and monitoring-based commissioning, to name a few. But most of all, I was thrilled about the revamp of the old stormwater credits to the new rainwater management credit. For me, one of the most important aspects of a livable city is its vegetation. The opportunity represented by rooftops, rights-of-way, alleys, and sidewalks to both bring additional vegetation to the built environment and manage rainwater through natural systems was an untapped opportunity in most LEED projects and in most cityscapes. So when v4 rolled out the new rainwater credit, I saw in its intent the recognition of this potential and looked forward to putting it to work. On my first v4 project—an urban office building with below-grade parking and two narrow strips of landscaping on the north and west sides of the site—I used the new credit as the basis for our approach to stormwater. Referencing the language “manage on site the runoff from the developed site … using low-impact development (LID) and green infrastructure,” we considered a series of LID strategies: green roof and contiguous planted areas above grade, and directing all roof drainage to a primary raingarden / bioswale with significant depth (2'–4') on the north side of the building. When we went to figure out how to do the calculations to see if we were meeting the LEED v4 credit requirements, we hit a snag. We were easily able to determine the runoff volumes from the 95th and 98th percentile events, but we couldn’t tell if we were “managing” the runoff, as there wasn’t a good definition of what “managing” meant. All of the site stormwater was going into the raingarden, and in doing so, was being slowed and filtered along the way—but that raingarden then drained to the city sewer. When we sought clarification from USGBC, we eventually learned that in the context of this credit, “manage” actually means “infiltrate.” So the credit effectively means that no water may leave the site; the entire volume in question must be infiltrated on the site or reused within the building. I then asked about green roofs, the poster child for urban green infrastructure, and learned that if a green roof has an underdrain that then connects to the city storm sewer, then that green roof isn’t “managing” the rainwater per the credit language either. This is especially relevant as Denver enacts a voter-mandated green roof ordinance later this year. It will likely come as a surprise that those green roofs don’t manage stormwater per LEED’s v4 definition. My hope is that USGBC provides a clarification in v4.1 to keep project teams from spinning their wheels on this point, and that they modify the language to encourage the more fundamental goal of a functional urban landscape. It may be that the intent of the credit is to intentionally equate “manage” with infiltrate. If the revised LEED v4.1 EBOM language is an indication, which revises the language “use low-impact development (LID) practices to capture and treat water …” to “use low-impact development (LID) practices to infiltrate, evapotranspirate, collect and reuse water onsite …,” that would suggest that the previous BD+C v4 language was just unclear, but not unintentional. If so, I think it is a missed opportunity to achieve the goal of greening our cities and urban sites by using LID to “treat” stormwater to some degree—through soil and vegetated area filtration—even if water ultimately drains from the site. Most urban projects physically cannot infiltrate rainwater back to the groundwater onsite, and reuse* can be cost prohibitive and a distraction from the primary intent of the credit (though I would like to see the Water section evolve to more explicitly recognize water reuse). In the end, I am pleased with where the project I described above ended up. It has a beautiful and functional vegetated landscape, and it channels nearly all of the site water through that landscape, reducing the rate of stormwater runoff and filtering the water in the process. If infiltration is a goal unto itself, then I would suggest that the credit evolve to make this a specific requirement for those projects with a significant percentage of non-building site area to work with (e.g., suburban and rural projects), but always award non-infiltrative means of stormwater management for urban sites. *Reuse has its own legal challenges in Colorado, where the project above is located, given the State’s restrictive water law. Why did the 2014 Addendum add the word "surface" (discharge)? Regarding the discharge requirement, I'm curious what everyone thinks is the significance of the addition of the word "surface" that was added as a Reference Guide Correction in the Addendum dated October 2014. As far as I can tell, this was the only change to the language in the Reference Guide made by this addendum, which now reads, "All runoff from the chosen percentile of precipitation events must be managed such that there is no surface discharge from the site." More specifically, I am working on a project where rainwater from the 98th percentile event is treated onsite, temporarily stored, and then discharged at less than the predevelopment rate via underground piping. There is no "surface" discharge from the project site. Does our project qualify for the 3 available points for Option 1 due to the absence of surface discharge? I agree completely! The only way to demonstrate the valid points you make are by having the outflow tested, and I suspect it is a much higher quality of water after infiltrating through the bioswale, than straight off roofs, parking lots and streets that many citizens and their 'leaders' accept. (Those same municipalities allow structures to be bulldozed to put up a new 'energy efficient' ones,) but the main issue with water is the chemicals they think are a substitute for natural filtration. "Manage" can be through infiltration, reuse (rainwater harvesting), or evapotranspiration. No stormwater should release off site for the target storm. The "further guidance" section made this more clear, but the newer v4.1 wording should help. Green roofs DO help manage rainwater. A green roof cannot increase infiltration (because it is disconnected from the ground), but a green roof does increase evapotranspiration. The green roof first intercepts rainfall, reducing runoff volume by absorbing into the vegetation/soil. Then, if a storage volume is provided in the underdrain, the green roof continues to draw water for irrigation over a number of days. These volumes must be calculated by your civil engineer, but can be significant if designed properly. Any surplus rainfall that cannot be managed by the green roof (through evapotranspiration) should be directed to additional management (rainwater harvesting, bioretention, etc). This is called a treatment train approach and is how low-impact design works.